To the north-west of the center of the city there is, perhaps, the oldest building of Bukhara - Ark fortress. Its high gentle walls more than one and half thousand years defended its emirs and rulers, and now delight the guests and residents of the city by its monumentality. Today, many buildings inside the citadel are destroyed and only one gate are survived, but the spirit of time is felt in every brick, every stone. According to the legend, this fortress was built by the famous mythical prince Siyavush of Iran, who fell in love with the daughter of the king Turan. The wily king had set an impossible condition to the youth - to build the palace on the bull's skin. But Siyavush was smarter - he cut the skin into thin strips, tied them into one rope and laid out in a circle, and then built the fortress walls on it. But this is only the legend. And today, archaeologists have discovered under the fortress the cultural layer at the depth of 20 meters. It is known, that the fortress was reconstructed several times. For example, historian Narshakhi in X century wrote in his "History of Bukhara”, that the governor Bidun Bukhar Hudot several times rebuilt the fortress, but it was constantly destroying. But then the wise men advised him to build the fortress on seven pillars, disposing them like stars in the constellation of Big Dipper. And then only the fortress ceased to deteriorate. Here is another legend. During the period of cultural flourishing of Bukhara, in X century, many famous scientists of the East - Omar Khayyam, Beruni, Abu Ali ibn Sina (Avicenna), Rudaki, and others lived and worked here. Thus, Avicenna opened one of the mysteries of Ark - the library, writing: "I found in this library such books that had never known and seen in my life. I read them, and it became clear the place of every scientist in his science. The gates to such depths of knowledge opened before me, about which I have never had any idea." In XIII century, during the invasion of the hordes of Genghis Khan the Ark was destroyed, but later it was rebuilt. Much later the fortress was the house of whole aristocracy of Bukhara, and the entire social life was confined within the walls of the citadel. 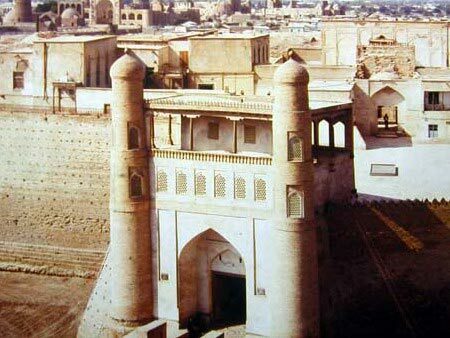 The Ark was the residence of Bukhara emirs until the end of existence of the emirate. And in 1920, when bombarded with aircrafts, it received the maximum damage. Although according to rumors, the Emir of Bukhara himself ordered to blow up the fortress so that the enemy got nothing. At the same time the big leather whip – the symbol of power of the Emir – was taken off one of the walls of the fortress. Today it is one of the major architectural monuments of Bukhara. Its walls rise to the height of 16-20 meters and the perimeter of the outer wall is nearly 800 meters. Only one gate remained, which is framed by two towers connected by the gallery above. Inside the Ark almost nothing has left, but restoration work is constantly undergoing, which purpose is the full restoration of the original appearance of the citadel. Outside, the walls remain as impregnable as centuries ago.